A young couple defies the odds. A Yankee soldier roils a Virginia girls’ school. Sofia Coppola’s remake of a pulpy 1971 Clint Eastwood period drama “weaves its own hushed, intoxicating spell,” said Justin Chang in the Los Angeles Times. Colin Farrell steps into the Eastwood role, playing a wounded Union soldier who’s hiding out at a Virginia girls’ boarding school as he’s nursed back to health, but this time the female perspective is front and center. Coppola— “scrupulous behavioral observer that she is”—tells this story of fear and desire with “the subtlest shifts in emotional temperature.” Despite some necessary bodice ripping, this new Beguiled will leave you less hot than bothered, said Brian Truitt in USA Today. A crime ring hands getaway duties to an asphalt savant. 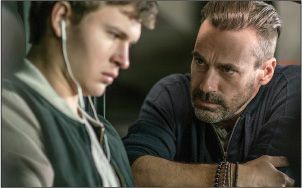 Elgort with Hamm: The kid has a gift.